Seeded 36th (out of 36), we knew from the start of the weekend that the only way was up. Everything was made slightly more difficult by the slippiest, shittiest floor we’d ever played on. Turns out the game is a little different when you have to skid every turn and plan your defensive routes accordingly. Our first match of the weekend was against a slightly hassled Durham team, who were delayed and so only arrived ~15 minutes before the game, featuring the infamous DCU, Brofessors and SB alumnus Joey. We went down a couple of points early, with some interesting offensive looks putting Durham ahead early. As we warmed up into the game the score pulled closer as the offense stopped turning over and we remembered how to play defence. Eventually we won. It was all a little close for comfort. Another close game. Where Durham had favoured around breaks, the Portsmouth gang loved their IO breaks. They had a few main offensive players (including one guy who would throw scoobers and one giant who could catch them) but the depth of the squad wasn’t as intimidating as some other teams, so we were able to exploit some mismatches on offense – did somebody say Humaira in the endzone? A number of the Jesters women were familiar to us through Punt, and we’d kept up to date with the fact that they had also won their first two games of the pool, so we knew we’d be in for a tougher game than the previous two. 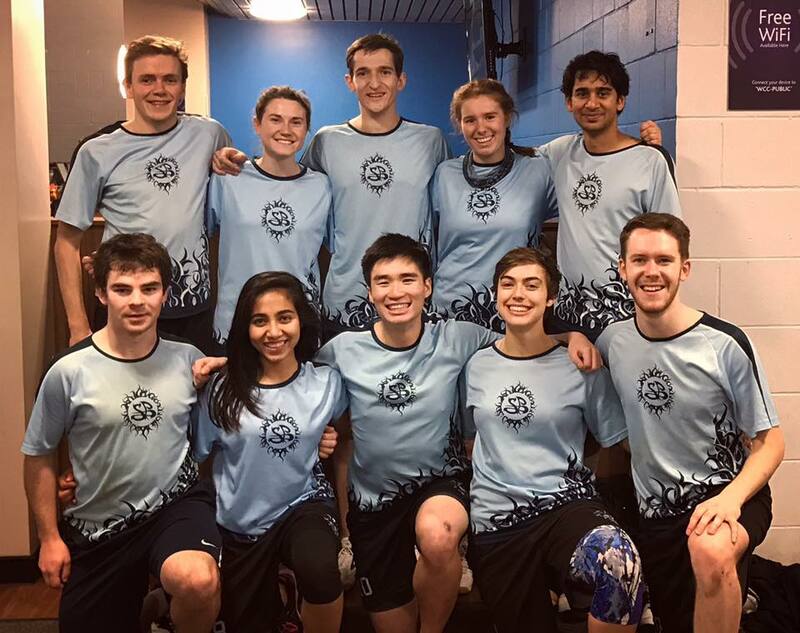 Jesters finished a well-deserved fourth overall, which was unsurprising given their good combination of strong women and men – the squad was deep and well-drilled, with an effective iso play that we struggled to shut down. One of their female handlers was tall and did a good job of using her height to get out high breaks around our forces; another was quick and smart with her cuts, and we did a poor job of stopping her getting free on the open side. The women were really a highlight of this team. We also had a few trust issues between forces and upfield defence, which left us open to some easy scores from the Jesters offense leading on from their initial iso movement, as forces overbid onto the open side and defenders overbid onto the break side. Aberdeen, eventual winners of Division 2, were an incredibly strong side. There wasn’t a single weak link on the team, and they had a number of standout players of both genders. I don’t remember a whole lot about this game to be honest, but they were an enjoyable side to play against and showed off some really classy ultimate. Sometimes it’s okay to lose to a good team, and these guys were great. We messed up a little here. High numbers of individual errors gave Bears 2 the disc more often than we could get it back. At some point in the game we adjusted a little to playing three women on offense, which I think was a good shout and allowed us to regain some ground, but unfortunately it wasn’t enough. One of their guys made great use of brutal high-speed blade pulls, and their cloggy defence caused us struggles getting out of the back of the endzone. Sad times. Saturday evening was great – we ended up going for dinner at this strange, tiny Chinese restaurant run by a man in a Wolverhampton Wanderers cap, and decorated with a huge number of love-hearts, encouragements, birthday banners, and at least one portrait of a world leader. Rogue. Back at the hotel we ate chocolate and practiced hair braiding. FXU were absolutely lovely, and also pretty great at playing the ol’ ultimate. They came third in their original pool after ending up on the wrong side of a three-way tie, then made it through their lower-half power pool before ending up coming third overall in the tournament – I reckon we got a little unlucky with the crossover (but we should’ve created our own luck by beating Bears 2 in the power pool). The FXU play was a good combination of flowing offense, smart defence and really gosh-darn tall guys. They made consistently effective use of poaches on defence and we almost entirely failed to adjust. Too many throwaways, not enough defence. Before the Portsmouth game there was some amount of strife within the team, which eventually worked out favourably with some tactical adjustments which helped us come through in our final two games of the weekend. Tessa gave us an inspiring speech about positivity, which was wonderful and really made a difference. We got behind early with some more poor offensive throwaways, they played a zone that collapsed to wall, and we couldn’t score through it quickly enough – sometimes not at all. A couple of their points came from high breaks to the tall bloke again, something which we were unfortunately not well equipped to defend against in terms of personnel (that is to say, height). It was a pretty soul-destroying game to be a part of. Pies has a bit of early success with an iso play led by our second SB alumnus of the weekend Chris de Leeuwe. We shortly did a solid job of shutting it down by switching JR away from marking Chris, in favour of somebody tall enough to stop him throwing the high release forehand around break. The offensive adjustment away from 3-2 towards 2-3, with an explicit emphasis on quick disc movements, made a big difference to the quality of our flow. It was good. We completed our gotta catch ‘em all of notable Cambridge alumni at UXIN with a game versus Clackers’ new team. This was also our first outing on a pitch not numbered four – exciting! Perry sprained his ankle early in the game, leaving us from time to time with Jonny as the main handler on the line, and JR got a pretty sweet layout D in front of the endzone. Humaira needed to catch a low disc for a score, and just fell into full on box splits to make it happen. A strong end to the weekend, that left us in 33rd place. We finished slightly above the middle of the pack in spirit, with a respectable score of 10.44. Once again we were let down with a low score for fouls and body contact, though we achieved scores of >2 in every other category.